If you ever took Journalism in high school or college, you learned about the “Five ‘Ws’ and the ‘H. 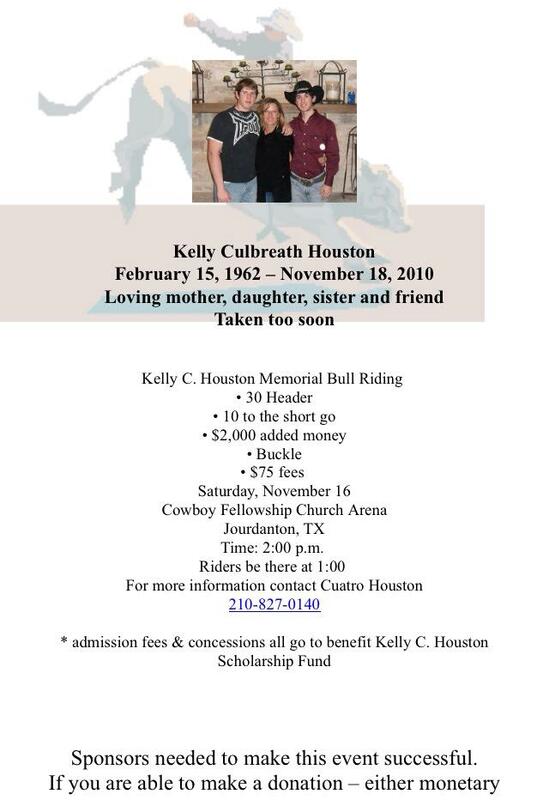 '” Well, here they are for this coming weekend’s Inaugural Kelly Culbreath Houston Memorial Bull Riding. Come out and be a part of raising funds in the name of a great lady…and you can have fun too! When: Saturday, November 16, 2013 @ 2:00 p.m.
How: To spectate: show up at the arena before the 2:00 p.m. start. To enter to ride or donate/sponsor: contact Cuatro Houston at 210-827-0140.